Has a pocket on the back too - seen in photo. 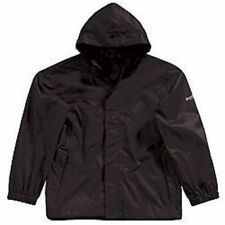 Boys rain Mac with hood and zip fastening, age 10. Excellent Condition. Perfect for warm spring & autumn days, cooler summer days and showery weather. From a clean, pet and smoke free home. Please check out my other listings. Combined postage offered. Boys jacket for age 3 years. Has a hood that folds back into a zip up collar. In good condition from non smoking house. Childs raincoat age 6, hood, 2 pockets. Folds up into its own back pocket, so to fit into a school bag, also has a hook fastening to attach to bag etc. 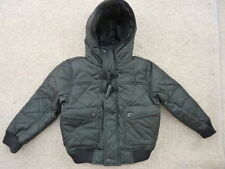 Boys TU Coat Aged 5-6 Years. grey hooded jacket with zip fastener. In excellent Condition. Dispatched with Royal Mail 2nd Class. Great for casual wear.It is Zip and Velcro fastening as well as press stud. fastening at bottom of the hood. Used only once or twice in excellent condition. Boys Green Camouflage Anorak. Size: 3 years. A gorgeous cagoule from TU. 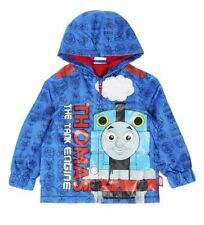 TU Boys Shower Proof Hooded Jacket. Shower proof. Colour may be Dark Grey or Black mix. NOT WATER PROOF. Small mark (see photo). Size 7 Years. Two pockets. Boys Tu (Sainsburys) Navy Padded Gilet Age 5-6 Years. It fastens up the front with a navy zip and toggle type tab in fluorescent yellow. It has 2 pockets on the front which secure with the same zip and toggle tab. There are 2 fake tabs at the bottom on each side with 2 silver coloured eyelets the yellow lace type effect and a leather tab. It is hooded and lined with a camouflage pattern inside. Only worn a few times so excellent condition and from a smoke free home. 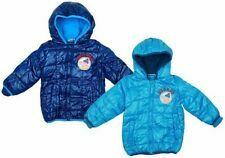 Boys 3-4 TU Coat, waterproof fully fleeced inside, hooded with fur around rim of the hood. Washes lovely. Has reflectors on the back. From a smoke and pet free home. Any questions please message me. Check out my other items. 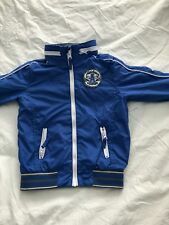 A boys jacket, blue and white with a breathable lining. It has no pockets. In good condition. On the Tu label age 11-12, 146-152 CMS. A childs name has been crossed out on the label. I am happy to combine postage. MY SON LOVED THIS COAT, JUST DONT FIT HIM ANYMORE. Lightweight but thermally-fleece lined jacket - showerproof and comfortable.